Many Hands Make Beautiful Work. 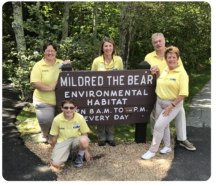 We can always use extra hands on Grandfather Mountain to help out, and we value everyone who contributes time to take care of the mountain. In 2014, Grandfather Mountain introduced a volunteer program to give our supporters a hands-on way to know the gratification that comes from introducing others to the wonders of our mountain. We are looking for hospitality hosts to welcome our guests and answer questions about the facilities. We also hope to find animal habitat hosts to interact with visitors in our environmental wildlife habitats area and provide information about our animals. Finally, we occasionally need help with special projects, such as events. Click here to read descriptions of the volunteer opportunities. Complete the volunteer application here! For more information, email volunteer@grandfather.com or call (828) 733-2013.